SHE CAME, SHE SANG, SHE SWUNG! I know that it’s not an exact translation from the Latin axiom — but it sums up what Dawn Lambeth accomplished with the Boilermaker Jazz Band last night at an Upper West Side swing dance. For finicky viewers, I must offer a caveat (that’s an even better tidbit of Latin): the video in this post is imperfect. There’s a good deal of noise from the dancers. But I think that’s a delightful thing. It did my heart good to see so many young people who wanted to swing. Their bodies reflected the music in three dimensions, and I didn’t hear anyone say a word about Jazz Being Dead. It isn’t and it wasn’t for them. Next time (when Dawn and the Boilermakers are in New York during the third week of April — mark it down!) Flip will try harder to get better videos. But he was distracted by the dancers, and I couldn’t blame him. Anyway, the Beloved was busy giving me a crash course in the basic Lindy Hop — slow slow quick quick. I’m good on 1 and 2 although 3 and 4 tend to become a blur. I do apologize to the three people whose toes I stepped on while going backward. I hope I caused no permanent damage. But I learned enough of the dance, to an uncritical eye, to get up on the floor several times at a medium tempo. All credit goes to the Beloved: a far better dance instructor that the long-suffering woman I tried to learn from for ten Firday nights in a row. If you’ve taken up another line of work because of me, Robin — something like munitions — I’m so sorry. My model in terpsichorean endeavors is one of my readers, a noble fellow named Ray Cerino, who’s a really fine dancer. He’s also one of those generous people who believes in sharing pleasures, and it was at his birthday party in 2004 tha I met, face to face, Kevin Dorn, Jon-Erik Kellso, Mark Shane, Vince GIordano, and Dan Levinson. What a band, and what a constellation of people to meet! Thank you, Ray! But back to Dawn Lambeth. To hear Dawn at her best, check out one of her CDs — details available at her website (www.usoniajazz.com); the same goes for the Boilermaker crew (www.boilermakerjazzband.com). But here they are in person. The song is one everyone associates with Billie Holiday, I’M GONNA LOCK MY HEART (AND THROW AWAY THE KEY). But bless Dawn — she doesn’t try to be Lady Day. Rather she approaches the song as a new text, on its own terms, and sings it for herself, which is what the great artists do. Notice her unaffected, conversational delivery, her mellow voice, her easy glide over the rhythm. If you don’t know her work, you should . . . . DAWN LAMBETH: FEBRUARY 7, NEW YORK CITY! Swing Remix Extravaganza is Saturday February 7th 2009 at our brand new venue, the JCC on the Upper West Side at 334 Amsterdam Ave by 76th Street. Doors open at 7:30 general admission. Free beginner dance lesson at 7:45pm. Live band at 8:30pm, event ends at 1:00am. February 7th 2009 features the Boilermakers! who have joined us in the past with great Fan Fare! Band leader Paul Consentino will also be featuring singer Dawn Lambeth from California. 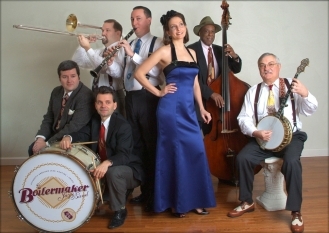 She brings her lilting effervescent style to this authentic hot jazz, ragtime and swing ensemble. Read all about them here. 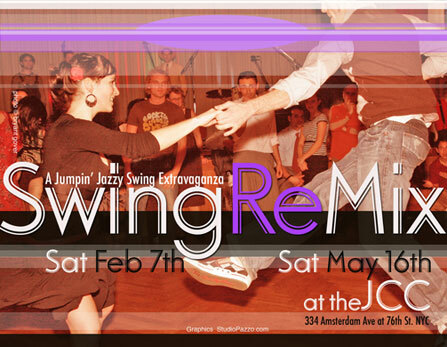 Swing Remix is featuring one fabulous workshop for Saturday February 7th with two fabulous instructors! Please note that we have a huge floor for these classes providing plenty of space for all attendees! Our special reduced price for online advanced sales is available only until NOON on Friday Feb 6th! online: $16 Workshop, $28 workshop and dance combined. Available here for this reduced price thru Feb 2nd. Price may increase after that date. General Admission: $15 at Door, $13 in advance, $12 JCC members in advance. Doors open at 7:30 for general admission 7:45pm Free Beginner Lesson, 8:30pm Band begins. DAWN LAMBETH might not be a household name to New Yorkers, but that’s something that can be fixed easily. She is an engaging natural singer. She doesn’t strain; she doesn’t overact. She’s no clone. She knows the changes (she’s also a swinging pianist). Although she can romp along on something like “Let’s Misbehave” or make the parallel suggestion at a much slower tempo, “Let’s Get Lost,” I think her forte is what musicians used to call “rhythm ballads” — combining sweet sentiment with a medium-tempo swinging surge. I’m so glad that she managed to sneak past the California authorities — who seem to have guarded her, kept her for themselves — to make this New York gig. Dust off your Capezios, if you’ve got them, and join us!